The Brooks Brothers Credit Card is currently running a nice $20 promotion. I got this in the mail, but you don't need to sign up for anything so it should work for everyone. Use the card 5 times (no minimum) outside of a brooks brothers store in September, you will get 2,000 reward points, good for a $20 gift certificate at Brooks Brothers stores (Yay, more free socks!). I have a Brooks Brothers credit card and it is a nice card, but it is certainly not an essential part of a credit card lineup. 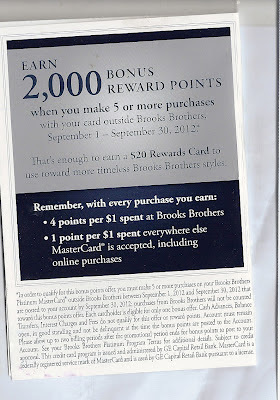 Main benefit is 4% of your purchases at Brooks Brothers go towards $20 gift cards. You have to spend $500 at Brooks Brothers before you are elegible for a reward.